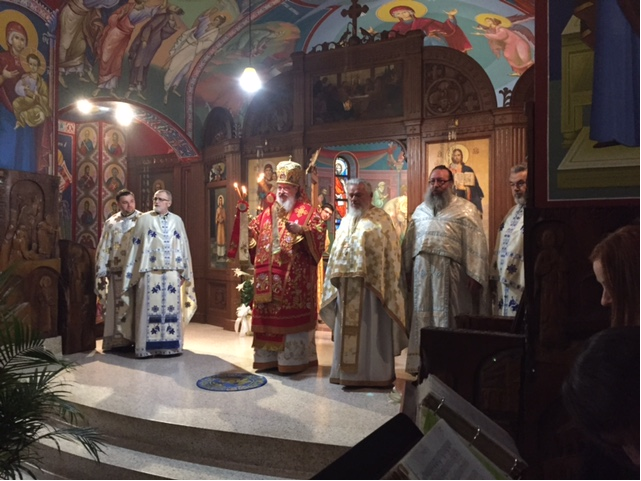 Libertyville, IL - Sunday, May 10, 2015 was the Burning of the Relics of St. Sava, marking the burning of the relics of St. Sava at Vracar in Belgrade by Sinan Pasha in 1595. This is the Slava day of the St. Sava Serbian Orthodox Monastery, Libertyville, IIlinois. On Sunday, the clergy and faithful enthusiastically joined together to acknowledge the holiness of St. Sava who lives despite the burning of his relics. 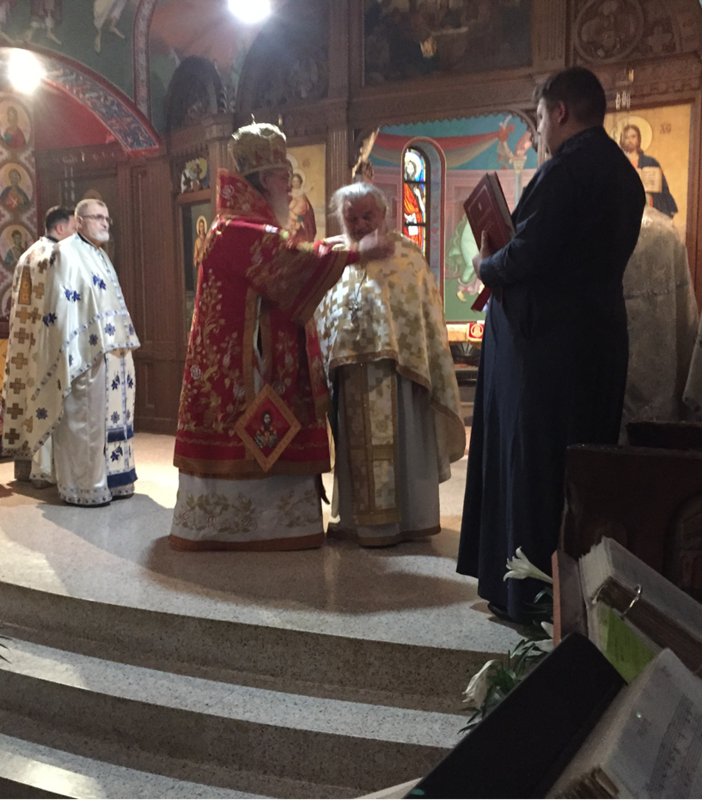 His Grace Bishop Sava (Juric) presided at the Hierarchical Divine Liturgy concelebrating with clergy: V. Rev. Marko Pantic, V. Rev. Jovan Jovic, Rev. Sindjel Seraphim, Rev. Petar Isailovic, Rev. Dr. Predrag Samardzic, Fr. Hieromonk Filotej and Deacon Nenad Jakovljevic. The Episcopal Choir sang responses and the seminarians chanted in the pevnica. During the Liturgy, Fr. Filotej received a pectoral cross and was elevated to the rank of Proto Sindjel (by Bishop Sava for Bishop Longin). Bishop Sava commended him for his humble service to the Church and particularly mentioned his caring for + Bishop Firmilian throughout his illness. Proto Sindjel Filotej was honored and moved by the bishops blessing. Axios! 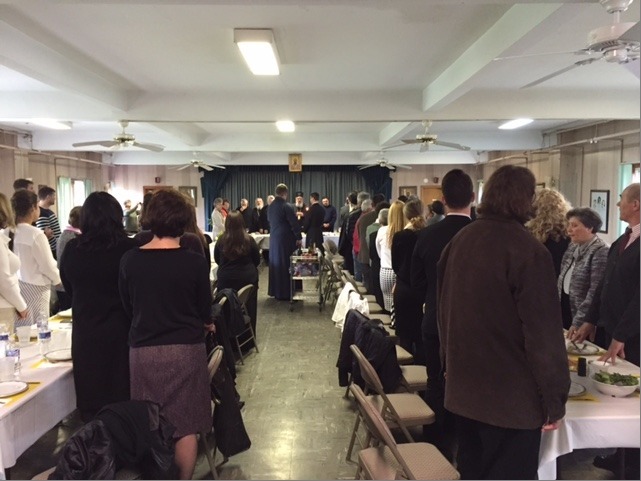 After the Liturgy, the Slavski kolac was blessed in Church with all singing “Svjati Mucenici.” Following the Liturgy, a festive luncheon was hosted in the hall by the Myrrh bearing women of St. Sava. Greetings were given by Fr. Predrag, Sandra Luburich of the Myrrh bearing women and Protinica Stojanovic, Diocesan Kolo Vice President, who thanked all for attending Slava noting that our ancestors were joyful at our celebration of this day. Bishop Sava then warmly welcomed everyone and exclaimed his joy in being at the St. Sava Monastery on this day. Bishop Sava described that he had returned to the Monastery of his youth where he was years ago as a teenager tonsured as a Reader and where he grew in his faith and responded to the calling of the priesthood. How fitting it was on St. Sava’s feast day for the Bishop to rejoice in the Church being unified following years of division and for him to return to Libertyville. He prayed for continual peace and growth in our Church with the hope that nothing would divide the faithful again. St Sava magnificently served our Serbian people by unifying, educating and healing us throughout the centuries – he gave a Christian soul to the people of Serbia. We pray that he may continue to intercede for the salvation of the Serbian people! Srecna Slava!